Desi Banks is an Atlanta comedian, actor, and writer that is known for his short videos showcasing his unique characters. Banks developed a skill for making people laugh through various social media platforms. This Atlanta native proves himself to be a charismatic, comedian genius that serves as all of your favorite people combined into one. You might know him for his characters: Lil Johnny, Keisha, Grandma Resa, and Uncle Earl, but he’s also finding his way to the stage doing standup, as well as acting. From being featured in movies like ‘Love by Chance’ alongside Terri J. Vaughn, Atandwa Kani, and Clifton Powell or collaborating with Wild N’ Out star, B. Simone to create unremitting content; he’s always working. 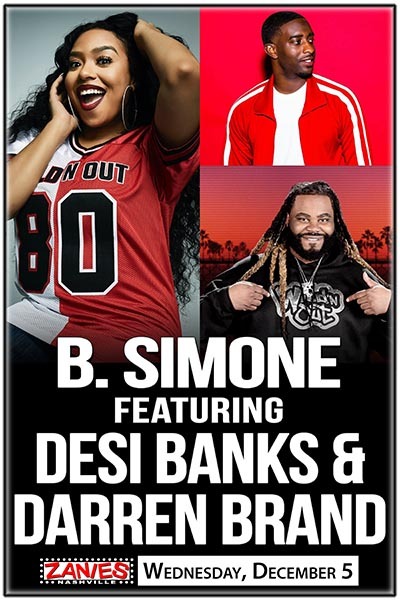 B. Simone is an American singer and actress, who was one of the recurring cast members on Season 9, who later returned to the show as of Season 11 of Wild 'N Out on MTV. B. Simone is hilarious, edgy, and already sweeping the world one like at a time. After transitioning to Atlanta, Georgia from Dallas, Texas, this American Comedian became an instant internet sensation connecting with thousands of people through social media. From hosting on the last days of 106 & Park to being DC Young Fly’s leading lady in Sundance selected film “Digital Lives Matter”, B. Simone is one to look out for. Introducing music to her many talents with her newest EP, “Stack Now Cry Later”, B. Simone is expanding her horizon and limiting herself to nothing. To many the sky's the limit, yet to B. Simone there is no limit. Darren Brand, also known as (Big Baby) is a American comedian, writer, producer, actor, and host best known for being a member of the comedy group "The Freestyle Funny Comedy Show" along with his fellow cast members, Chico Bean and B-Daht. He is one of the recurring cast members of Wild 'N Out on MTV and MTV2. Besides him being a cast member of WNO, he has also made numerous appearances in Season 3 of another MTV show, Joking Off. Brand also hosted the nomination special for the 2017 BET Awards and also appeared in a special revealing the nominations a year later.